Agenda slide is usually the second or third slide. During the course of the PowerPoint presentation, we may have to refer to that slide frequently, especially when the next agenda item is taken up. Most of us copy paste that slide multiple times. This may work, but if the agenda slide changes, we may forget to update other slides. The same method can be used to refer to any key slide or slides during the presentation. The key thing expectation is that you may show this slide at any point during the presentation. After showing the slide, how do you come back to the slide where you were? Here is how you do it. Yours is the fifth presentation in a conference. You have a one hour time slot. By the time your turn comes, things are severely delayed. Just before you go on stage, you are told that you have only 30 minutes. Your presentation is already copied to a common laptop which is on the podium. You have absolutely no chance of editing the presentation on time. 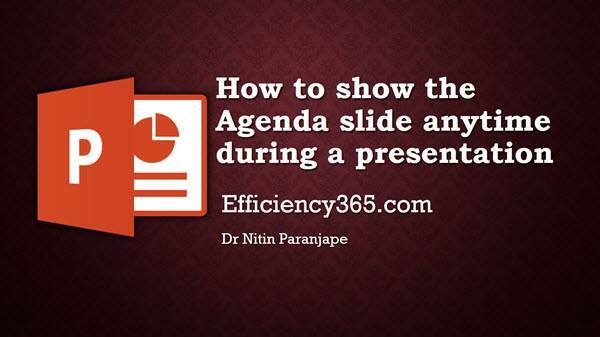 You try to speed up the presentation initially, but soon, you will fall back to your regular speed. You are doomed for an imcomplete presentation dilemma. You also know that you have not done justice to the incomplete presentation. It is a hopeless situation. But you still want to salvage it in a professional and elegant manner. Live broadcast to 50 persons using PowerPoint, for free! To deliver a live broadcast you need some other application – like Skype for Business, GoTo Meeting, etc. PowerPoint has a built in system which is very easy to use and effective. Read on to find out how.